With more time on your hands than ever before, travelling in your 60s is a great way to relax, explore and discover something new. But before you jump right in, it’s important to make sure you’re properly covered with travel insurance. As specialists in travel insurance for people with pre-existing medical conditions, we can make sure you’re covered properly. With no upper age limit on our Single Trip policies, you can also travel with peace of mind with the whole family. Find out more about our travel insurance below or get your quote in minutes online, or by calling us on 0800 888 6195. What is over 60s travel insurance? As specialists in travel insurance for people over 50, we create policies that cover the things that are important to you, to a level that suits your needs. After all, your holidays may have changed and grown with you over time, but your travel insurance may not have. We offer up to unlimited medical expenses, cancellation cover up to £7,500 and baggage cover up to £3,000 – all available on our Deluxe cover option. It’s travel insurance designed with you in mind. 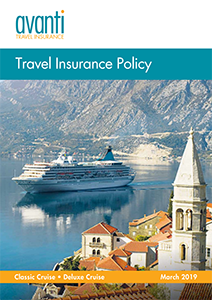 So, whether you’re planning a relaxing cruise, a worldwide cultural discovery or a short UK break, we can help make sure you’re covered. Why choose Avanti Travel Insurance? With three levels of cover to choose from there’s a level of cover to suit you and your family. Whether you have diabetes, high blood pressure or anything else, it’s important that you tell us about any pre-existing medical conditions that you have. Telling us about your conditions means that we can make sure you’re covered properly and that you have a valid policy. As specialists in travel insurance for people with pre-existing medical conditions, we consider all conditions and will ask everybody who gets covered with us if they have anything to declare. It’s just a few simple questions and takes a few minutes to help us find out more information about how your conditions affect you to make sure we can offer you the right cover. If you’re worried about the types of questions we ask, or if we cover your condition, you can find out more information about travel insurance for people with pre-existing medical conditions. 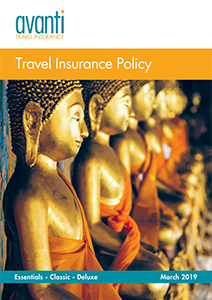 Ready to get your travel insurance sorted? Let’s go! Let’s get you covered in minutes. Get a quote and pay online in minutes, or call us today on 0800 888 6195 if you have any questions.